This blog is on hiatus. Please enjoy the previous posts on architecture, landscape and design in children's books, and feel free to drop me a line if there is a title you would like to see reviewed. Barbara Lehman, Trainstop. (New York: Houghton Mifflin, 2008). Cities are about both scale and connectedness. The act of crossing paths with each other energizes our economy and enlivens our streetscapes. Adults navigate the city with appropriate destinations at the forefront of their minds: one site is for buying groceries, another is for boarding the train to work. Distances are frequently measured in time, rather than space. For a child, though, these labels are more arbitrary. Spaces which appear void to the adult mind may hold almost limitless appeal to a child, as anyone who has tried to extract a toddler from a dirty corner in train station can attest. Barbara Lehman’s Trainstop celebrates a child’s ability to create interest in seemingly dull space while also introducing readers to the idea of urban life as a series of miniature journeys. 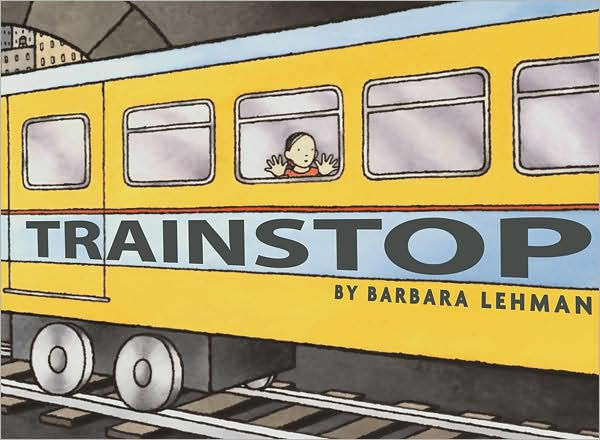 Like Lehman’s other publications (Museum Trip, Rainstorm and The Secret Box), Trainstop is a wordless picture book which will appeal to a broad audience. The protagonist, a girl of grade-school age, takes a subway ride with her parents. While the adults on the train attend to their own business, the girl witnesses a magical world appear in the train windows. Suddenly, the train stops. The adults sleep while the girl is invited to help a renegade colony of tiny dolls rescue a friend stuck in a tree. Acting in the role of strong and capable adult, the girl easily reaches the stranded toy and reunites him with his friends. Re-boarding her train, the girl slips back into the role of child in the city. Her dependent status is quickly encapsulated in a view of her clasping the hand of a parent as she gets ready to re-enter a world scaled for adults. In the book’s final pages, the dolls bring a tiny tree as a sign of their gratitude. Eventually the tree, like the girl, reaches the ‘proper’ scale of the urban landscape. In 30 pages, Trainstop demonstrates how urban voyages can have more than one destination. It’s all in the eye and mind of the traveler. Further reading, for adults and children together: Walker Evans, Many Are Called (2004); Mark Ovendon, Transit Maps of the World (2015).